La Scena Musicale has reached a major milestone: its 20th birthday. The gala-concert celebration on November 24 at the Salle Pierre-Mercure of the Centre Pierre-Péladeau was brimming with youthful optimism. 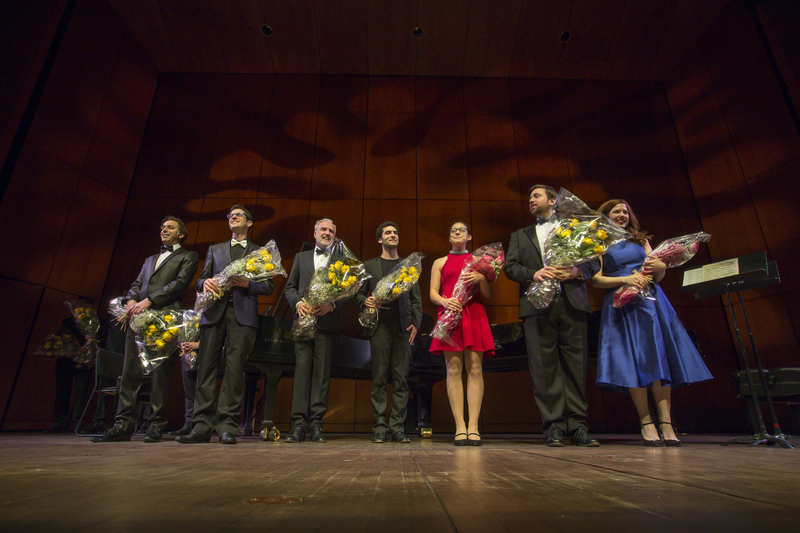 Many up-and-coming classical musicians and opera singers animated this event, which was dedicated to the late journalist and author Lucie Renaud, one of La Scena Musicale’s most brilliant collaborators. Over the course of this colourful evening, brilliant young rising stars filled the stage, bringing the audience on a musical journey through classical music and opera. Soprano Chelsea Rus and baritone Hugo Laporte sang arias and art songs from the French, Italian, and German repertoires. Clarinetist David Dias da Silva performed Debussy’s Première Rhapsodie supported by pianist Olivier Hébert-Bouchard. Violinist Joshua Peters was accompanied by pianist Philippe Chiu in the first movement of Beethoven’s Sonata no. 9, “Kreutzer.” Pianist Emily Oulousian played Beethoven, Chopin and Prokofiev with grace. The Piano Caméléons, Matt Herskowitz and John Roney, performed jazz-tinged arrangements of Bach, Chopin, and Debussy. Celebrated pianist and pedagogue Michael McMahon provided the singers’ accompaniment. The subtle and refined humour of the members of Quartom, the evening’s MCs, provided a note of levity. At the end of the gala, the audience was invited to share cake celebrating this 20th birthday, which signals new horizons for a publication that has marked the Quebec and Canadian music scenes with its originality and singularity, as attested by the numerous messages of congratulations and encouragement from members of the political and artistic community.